After one glance one would normally label it as childish. Well, it is that too, but above all, it is a fun interesting and entertaining anime. Ok, until now i have not seen the full thing yet so i cant say about the second half of the anime, however the first half is good. In this world, Alice refers to your power, what we would call gifts and talents, they call those Alice. You have the regular geniuses, and your regular powered up humans, but there is a lot of other weird and fun alices. From fire manipulators to x-ray eyes, to teleportation, to time-travelling, to fart that makes you faint, it is a show that will definitely keep you awake. it does get slow at points, and the main lead might not be what everyone likes, but overall i would say that the show is above average. This anime is about a girl who chased her best friend after her best friend changed school. So she runs away from home to look for her friend and ends up getting admitted into the school. There are crazy interesting teachers, as well as the typical teachers that you would hate in real life. But behind all the happy fun and laughter at the school, many students feel like they are imprisoned in it. They are shielded, “protected” from the rest of the world to avoid mayhem in the outside world. This school also hides a big secret and it is being run like an organization. What happens and how things turn out? You have got to watch and see it for yourself! The opening song is cute and brings me back to my primary school days. It is not the best anime in the world, but it is above average. 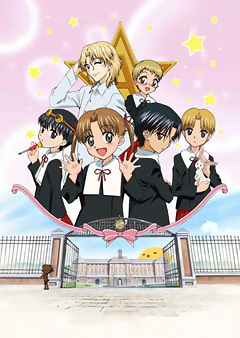 So if you feel up to it and feel like having some brainless laughs check Gakuen Alice out!